NOTE: This book has not yet been released. I was given a free Advance Reading Copy by HarperCollins and Edelweiss in exchange for an honest review. This book will be released on July 31, 2018. If you would like to send me an ARC, please see this page. PLOT SUMMARY: After Cecelia's little brother dies in a tragic accident, her entire life has been upended. Things only get worse when Cecelia's mother leaves for the Land of Yesterday, the forbidden realm where the dead go, to search for her son. The spirit that inhabits her family's home, Widdendream, blames Cecelia for everything horrible that has happened, and holds her father hostage until she can get her mother back. So, Cecelia sets off alone to the Land of Yesterday, determined to put her broken family back together. FIRST THOUGHTS: First of all, I feel like I need to apologize approximately 1,000 times for taking SO DAMN LONG to write this review after reading! I thought this review would be a breeze, since I loved this book so much. But, obviously, that's not the way this worked out. But seriously -- this book was incredible. 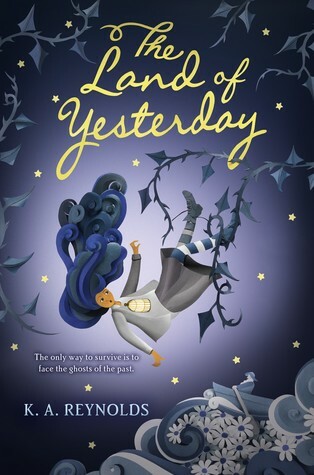 I don't know if it's going to be a series; it stands very well on its own, but the story of Cecelia and the Land of Yesterday has plenty more to offer. This is a magical, melancholy read, perfect for all ages. THOUGHTS ON PLOT: When I read the description of this book's plot on Edelweiss, I just knew I had to have it. I love how it's slightly darker than most middle grade fiction, but not overly-so. The story mostly follows Cecelia's journey through the Land of Yesterday, but I took it to be, more than anything, a story about grief, and how we deal with loss. All of the Dahls (plus Widdendream) react differently to the loss of Cecelia's brother, and the consequences for dealing with grief badly are disastrous. I think this book could be a great way for kids, especially younger ones who don't really have a grasp on their emotions yet, to learn about and understand grief, especially the kind that comes after losing a loved one. I don't know if that was the author's intent, but that's what I took from it. Loss is a messy, complicated thing -- and it's something we all go through. It's great to see a book, especially one for children, that handles it so well. THOUGHTS ON CHARACTERS: The two characters that stood out to me the most are our heroine, Cecelia, and our villain, Widdendream. Cecelia is a great lead; flawed, but endearing and deeply sympathetic. She came off as a very real kid to me, handling situations the way a real child might. I especially loved the way her reaction and handling of her brother's death is portrayed; you just want to go into the book and give the poor girl a hug. Widdendream, meanwhile, really surprised me. I thought right from the word "go" that the idea of a sentient house (or house spirit, same difference) was cool, and added a lot to the world the story took place in. When Widdendream becomes villainous, it's genuinely saddening, since it has such history with the family. And, without getting into spoilers, the last couple chapters added a lot to Widdendream's character. Even though it's the antagonist, and, ya know, a house, it's still strangely relatable, even though you know what it's doing is wrong. You know you have a gem of a book when a freaking house manages to get an emotional reaction out of your reader. THOUGHTS ON WRITING STYLE: I've described this to my friends as "very Roald Dahl," which I don't think is a coincidence -- check Cecelia's last name. If I had to choose one word to describe the prose, I'd choose "whimsical." There are a lot of fanciful descriptions and turns of phrase, which for the most part were a delight to read. There were, however, sections where it was a bit overdone, sometimes to the point where I had to reread to know what was even going on. While it didn't detract from how much I enjoyed the story, it did make the reading experience less fluid, which is never good. However, while I know the Dahl-esque style isn't for everyone, I really liked it. If you also happen to like that sort of thing, you'll probably like this. THOUGHTS ON POLITICAL STUFF: Not too much to talk about here, but I did really like that Cecelia is a WOC. Her exact ethnicity is unclear (and it's a fantasy world where countries as we know them don't even exist, which does make specifying race and ethnicity slightly complicated), but both the cover art and a few offhand lines made it clear (at least to me) that she's not white. There's not a whole lot of diversity in fantasy fiction, so it's always a breath of fresh air when an author averts that problem. I've already mentioned how much I liked the story's handling of grieving and mourning, so I won't go too into that. FINAL THOUGHTS: If you're looking for a magical, wonderful read, add this book to your TBR pile. I've never read anything from K.A. Reynolds before, but I'll definitely be checking out the rest of her work now. I'd really love to see more from this world, but what we have is already so good, that if she chooses to leave it, I'd be okay with that. I can't wait for this book to come out -- I want to hear what everyone else thinks! So, seriously, go pre-order it. I'll wait. If you've read or are planning to read The Land of Yesterday, I'd love to hear your thoughts in the comments below!